$875.00 Navy officer dagger with sheath, WW 2 type without a button, dated 1945. Features very low serial number on the blade, 7969. An extremely attractive early piece in very good to excellent condition. $450.00 Navy officer dress dagger with leather sheath, dated 1951. A magnificent early piece in superb condition. $295.00 Navy officer dress dagger with leather sheath, late version maker marked "Bulat", dated 1982. In excellent condition. $675.00 Air Force officer dress dagger with leather sheath, 1950s issue with official document allowing the owner to keep the dagger upon his retirement from the military in 1977. A very interesting and uncommon set to a Naval Aviator. The dagger is in very good to excellent condition, free of significant wear or damage. 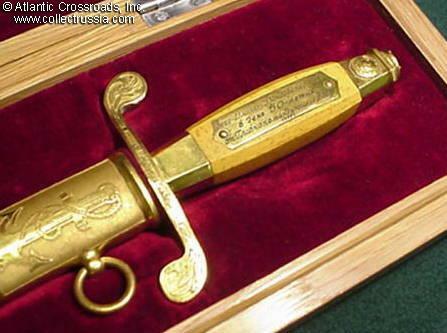 $950.00 Special Presentation Box for a Soviet award dagger, circa late 1950s through 1960s. A version in medium-toned hardwood, with the round button and simplified locking mechanism. A very scarce accessory made specifically for the official award daggers. Very good to excellent condition. $440.00 Finish War era Tokarev SVT-40 bayonet with scarce teardrop (ball finial) scabbard and integral OD canvas frog, circa 1940. Excellent example. $330.00 World War 2 Tokarev SVT-40 bayonet complete with second type flat point scabbard and integral leather frog. In excellent condition. $345.00 Navy Admiral or Officer full dress belt with dagger hangers, circa 1947-1948 issue. Very impressive early piece in gold brocade with black liner. Comes complete with dagger hangers, gilded hardware and belt loops. In very good to excellent condition. $345.00 M 1940 Waist Belt with Hangers for Navy Officer Dagger, 1940- 1947. Early, narrower pattern, featuring so-called "kind lions" on the buckles and without the larger round buckle up front. In excellent condition. Fits up to a 42" waist. This rare and desirable WW2 model is a perfect accompaniment for a wartime-dated dagger. $125.00 M 1947 Waist Belt with Hangers for Navy Officer Dagger, 1947- 1955. This excellent early post-war example with "angry lions" can be a superb addition to a late 1940s - early 50s naval dagger. $90.00 M 1955 Waist Belt with Hangers for Navy Officer Dagger, circa 1960s-70s. Heavy duty black silk ribbon with black velvet lining, anchors and stars on brass buckles, larger round buckle on the front. Very uncommon Extra Large Size: the belt was extended by a tailor to accommodate up to 55" waist, although it is still easily adjustable to almost any smaller size. In excellent condition. Perfect accessory for either a 1950s or 70s dated naval dagger. $24.00 Naval officer's full dress belt with dagger hangers, adjustable up to a 44" waist, circa 1970s-80s. Excellent, unissued condition. $450.00 Full Dress Belt with Dagger Hangers for Navy officer of Engineering or Administrative branch, 1947-1951. In silk brocade, complete with massive gold buckles and hardware for the dagger. Beautiful quality, uncommon piece. Excellent condition. $110.00 Cavalry sword harness in leather, circa 1930s. Essential for the correct display of a shashka on a manikin. $120.00 Leather knot for a general dress sword, circa 1960s-70s. In near mint condition. $550.00 M1945 Army General's Belt in gold bullion brocade for wear with the dress uniform, complete with dagger hangers, dated 1947. Extremely well-made and impressive piece, better than the general dress belt of later years. In very good condition. This can be a beautiful addition to a Soviet Army or Air Force dagger or to an M45 General's "Victory Parade" uniform. $28.00 Army / Air Force officer full dress belt with dagger hangers, early to mid 1980s. Near mint condition. $290.00 M 1952 Waist Belt with Hangers for Air Force Officer Dagger, dated 1953. This very scarce model was in use only until the late 50s, prior to the reform of the Soviet uniform code. In excellent condition. $140.00 "Russian Edged Weapons", by Alexander Kulinsky. St. Petersburg, C. 2005. Russian Text. 10 1/2" x 8" x 1 3/4". 5 lbs. 581 pages. Hard cover. Hundreds of beautiful, large format color photographs. The ultimate reference book on this subject. $100.00 "Soviet Dirks", by Evgeniy Boldyrev et al, C. 2014, Russian and English text, 221 pp, large format laminated hard cover. A fantastic in- depth reference on Soviet daggers of all types and periods, with an incredible amount of factual information on years of manufacture, variations etc. The book also contains excellent information on dagger belts. This is going to be the ultimate reference source on the subject.